(Newser) – Thai protesters, angry over a government they say remains controlled by an ousted leader, have stormed the country's foreign and finance ministry compounds. 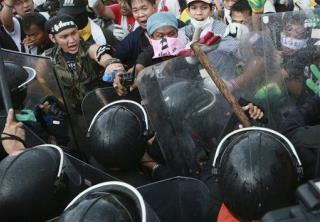 The demonstrations follow a protest yesterday in Bangkok that drew 150,000, making it the country's biggest in years, the AP reports. Today, singing and dancing protesters poured through finance ministry buildings, with activist and former deputy PM Suthep Thaugsuban calling on them to "go up to every floor, go into every room, but do not destroy anything." Some demonstrators cut electricity to the country's budget bureau. Others set up sleeping mats in government buildings, Reuters reports. Four years or so ago, tens of thousands of Iranians clogged the streets of Tehran, impeded traffic, clashed with police, broke windows, set cars and buses on fire and, supposedly, sustained one casualty, all in service to the political aspirations of their leader, Hossein Mousavi who never left his mansion. The dispute claimed that Mousavi had been elected, not Ahmadinejad. They were hailed by craven servants of the New World Order as “champions of freedom, liberty and democracy”. About four years ago, tens of thousands if not hundreds of thousands of Red Shirt demonstrators clogged the streets of Bangkok, clashed with police, set up tire barricades in the streets and commandeered a fire truck and turned it into a fountain. They were accusing the true winner of the election being denied office. The military finally overran their main protest area, breaking up the demonstrations. Dozens of demonstrators were killed by government forces almost every day. Comments in the West condemned the Red Shirts of having no respect for the public, since they impeded their movement around the city. The Western comments denou8nced the demonstrators for “presuming to speak for the rest of the country, although the demonstrators themselves were only a tiny fraction”. The comments assailed their clashing with police and setting up the barricades and accused their leader of cowardice for not being in the front lines. The New World Order doesn't seem to mind engaging in hypocrisy openly, baldly, in broad daylight. That the “news” now depicts the demonstrators, or “demonstrators”, with a hint of admiration and support, and the fact that, now, government troops did not stop them, only suggests that this is not authentic. This is a fraud. Whatever is guiding this development is not acting in the interests of the people. (R) 2016 Gov. RICK PERRY Report: Our Thai community in Houston / Pasadena, Texas think the Thai yellow-shirt party will reclaim political power from the red-shirt party to takeover the next new Thai presidency again. It's amazing when people pushed up to the limits go out there and reclaim what's theirs. The right to peaceful and fearless living.